Bankcard association UnionPay International has launched its host card emulation (HCE) and tokenization based mobile payment service in South Korea, enabling its cardholders to pay by tapping their mobile phones. The launch of UnionPay HCE mobile QuickPass is supported by mobile network operator KT and its subsidiary BCcard. “Now, Korean cardholders can bind their UnionPay cards issued by BCcard or its members with their NFC-enabled mobile phones,” UnionPay says. “Then, they can tap their phones to pay at the QuickPass terminals at Doota, all local Watsons and GS25 and Gong Cha stores, as well as over 7m QuickPass terminals across mainland China, Hong Kong, Macau, Taiwan, Singapore and New Zealand. “This cooperation is a significant step UnionPay takes in promoting its mobile QuickPass around the world,” says Ge Huayong, chairman of China UnionPay. “It enhances card-using security and caters to cardholders’ new card-using habits. 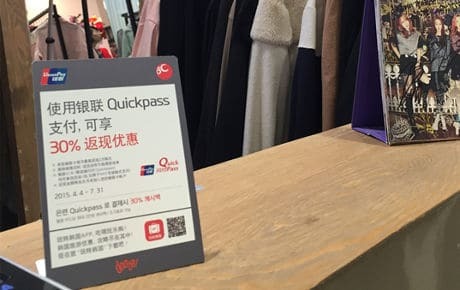 More than 20 commercial banks signed up to support mobile QuickPass when it made its launch in Beijing in December 2015.